Please click the button below to give us a review on Facebook. We really appreciate it! Oh my goodness, we love our Bongo! 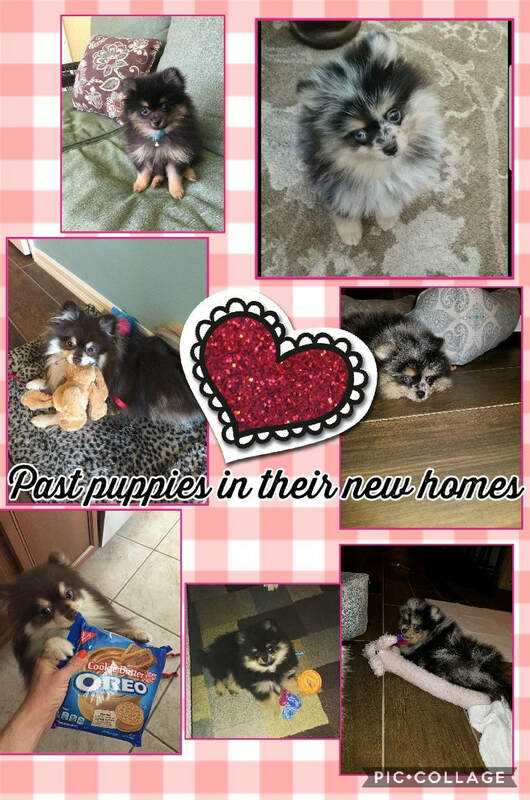 After much prayer and lots of searching for a reputable hobby breeder for Pomeranians, we found Ashley and Dean. When we saw Bongo (the puppy formerly known as Colby)on the website, we knew we found our fur baby! We loved receiving the videos and pictures each week. It made us feel like part of his life right away all the way from Georgia. Ashley and Dean are such nice, kind, and loving people. We can tell Bongo was well cared for and loved for the first nine weeks of his life. ��� God bless you guys! We are so blessed that we were able to bring Skye home. Ashley and Dean go above and beyond to make sure their puppies are taken care of and going to loving homes. I have known Ashley for 20 years and she absolutely loves and adores her poms. She and Dean are wholly and exceptionally dedicated to raising healthy puppies, and always providing the absolute best veterinary care for the pups and mama pom. They are amazing breeders whose main concern is the dogs, not the money. I wouldn't hesitate for a second if considering buying a pom from them. I found Ashley and Dean through a friend. I live in Virginia so I wasn't sure what to expect because I couldn't meet them. But they are the best she answered all my questions and got back to me everyday soon as possible. I couldn't ask for better breeders they treat all the pups like they are truly all her babies. Best and easiest experience working with them. 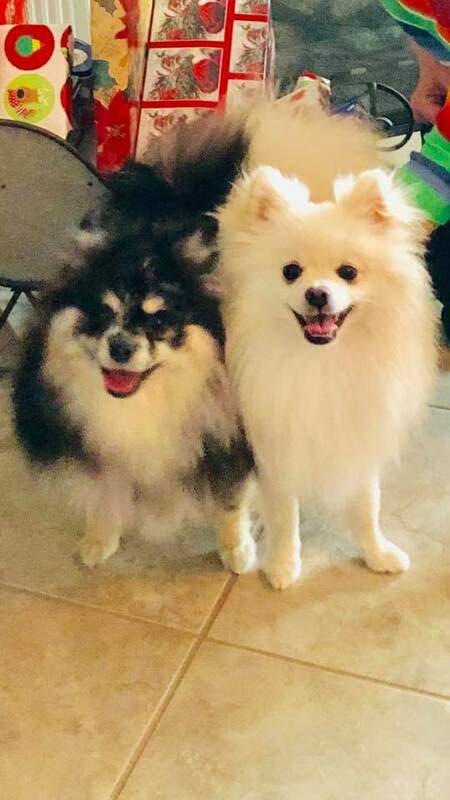 I can't wait to get another pom from them! Our baby is truly loved. I have purchased two beautiful Pomeranians from Ashley and Dean, one is a chocolate and tan Ppm and her name is Tiana and she's the love of my life. The second one I purchased is a black and tan and white and her name is Fiona. They're both beautiful dogs with great temperament. It's a pleasure to buy from her. I know her personally and if I ever decide to buy another Pom she's the one that I'm going to. The environment in which she raises her animals is plush and for staying I can honestly say that from the bottom of my heart. She's a great breeder. We adopted our little Harley from Ashley and Dean. It was so obvious from the beginning how well this little guy was taken care of. He loved everyone immediately. You could see that they spent a lot of time socializing their puppies. We love this little guy so much already. I'm so glad we found Ashley and Dean. Thank you for doing such an amazing job caring for your puppies. We love our sweet little girl Biscuit! You can tell she's been very socialized with Ashley and well taken care of! She has the sweetest personality and is absolutely gorgeous we definitely recommend Dolce Vita Poms! Ashley & Dean are amazing breeders! It is obvious that they truly love their pups and want the best placement for them. We love Kona to pieces and appreciate all you did to spoil her. We loved getting the pics and videos of her before she was ready to come home. Ashley even let us take Kona's favorite toy home & has been extremely patient with all my questions. We will purchase again from yall in the near future. December 20 · I just adopted my sweet little Sophie from Ashley and Dean and she has been nothing short of amazing!! It is very obvious that their puppies are extremely well cared for and loved as my Sophie is not afraid of anything and has been extremely well socialized. She slept through her first night and potties on the potty papers! She is an absolute dream and the most beautiful little puppy Pomeranian I've ever seen! Thank you Ashley And Dean!! Well done! I recently adopted my little Cocopuff and had an awesome experience with Ashley and Dean. You can tell that they love their puppies and want the very best for them. Ashley sent me sweet pictures and updates of my baby and how she was doing until she was ready to come home to me. Cocopuff is gorgeous and an absolute joy! Thank you so much. We are so happy that we found Ashley and Dean. You can tell that they really love and care for each of their pups. Teddy is such a joy and we can't wait to watch him grow. Due to a concert in Florida there were no motel rooms available Ashley and her husband called all over and found a room for us and actually drove to the motel to make sure we got our room. They have the biggest hearts and so much love for their heavenly babies, I would not hesitate to buy from her again. Such a wonderful and caring breeder. Ashley is such a sweetheart!!!!!! Ashley & her husband love their babies. They are all definitely raised in a home full of love & attention. All their dogs are gorgeous and bred to standard. I would recommend this breeder if you are looking for a well socialized and loving forever companion.